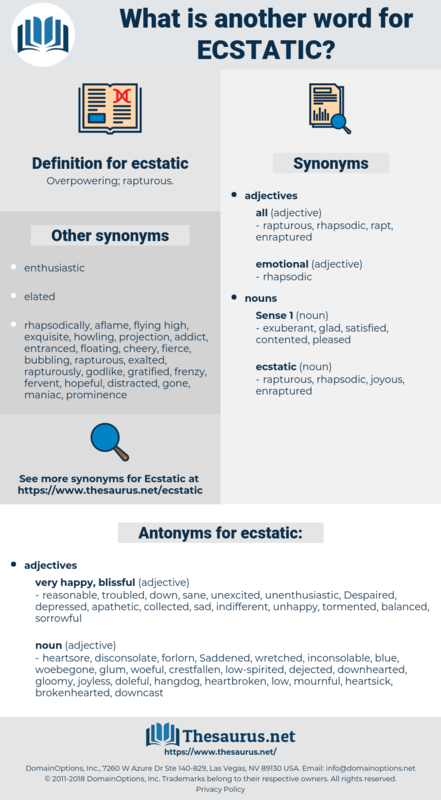 What is another word for ecstatic? enthusiastic, overjoyed, climactic, delighted, excited, happy. reasonable, troubled, down, sane, unexcited, unenthusiastic, Despaired, depressed, apathetic, collected, sad, indifferent, unhappy, tormented, balanced, sorrowful. heartsore, disconsolate, forlorn, Saddened, wretched, inconsolable, blue, woebegone, glum, woeful, crestfallen, low-spirited, dejected, downhearted, gloomy, joyless, doleful, hangdog, heartbroken, low, mournful, heartsick, brokenhearted, downcast, sorry, melancholy, disheartened, despondent. Keith kept recurring to the ecstatic realization that it was all right. Muriel was already deep in Will's ecstatic letter. 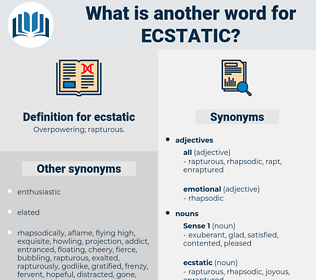 ectasia, East Sussex, equisetaceae, equetus, eighties, east sea, esthetics, esthetic, exotic, estate tax, esthesia, exostosis, eustachio, ectasis, excise tax, ecstasy, exegetic, ecdysis, EGTK, esthesis, egoistic, eighty-six, exodus.